USDJPY will be under the influence of some economic reports such as the Economy Watchers Sentiment, Final GDP Price Index y/y, Current Account and Bank Lending y/y in Japan and the US is publishing Natural Gas Storage and Unemployment Claims. 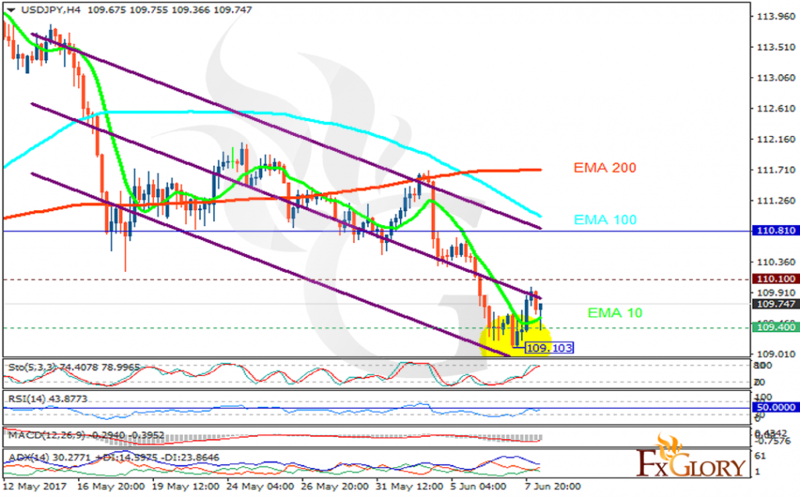 The support rests at 109.400 with resistance at 110.100 which both lines are below the weekly pivot point at 110.810. The EMA of 10 is moving with bullish bias but it is below the EMA of 100 and above the EMA of 200. The RSI is rising towards the 50 level, the Stochastic is moving in high ranges and the MACD indicator is in negative territory. The ADX is showing sell signals. The support level breakthrough will push the pair downwards targeting 102 otherwise if the resistance area is broken, further growth will be expected.